holasport.isHólasport is a small family-owned business that specializes in Adventure Tours on Quad Bikes and Super Jeeps. Hólasport is located at Hotel Laki, 4 km. from Kirkjubæjarklaustur. 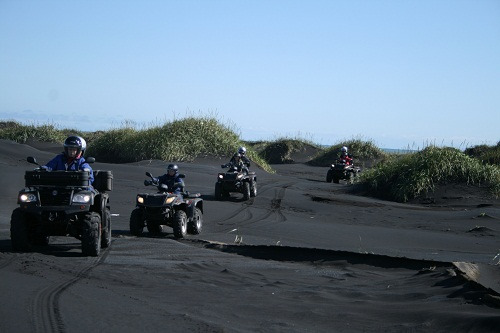 Hólasport offers Quad Bike Tours from 1 – 3 hours with local guide. Departures from Hotel Laki. You can explore new places not easily accessible in any other way on a Quad Bike. In our Quad Bike Tours you will drive through Lava, over Black Sand, across water and into the magnificent area of Pseudo Craters. In the Black Sand Beach Tour we will stop at the old emergency shelter for fishermen for small refreshment. There is a lighthouse that you can climb up for a greater view next to the shelter. You will see old shipwreck and there is a great possibility to see seals. Day Tour to Laki Craters in a Super Jeep every day at 09:00 from Kirkjubæjarklaustur. Mountain Expedition and Black Sand Beach Tour in a Super Jeep - 2,5 hours - Departure from Kirkjubæjarklaustur. We offer custom-made tours for various interest-groups in winter by requests.